I finally saw the film Changeling. I know. I know. This really good movie came out back in 2008. Sometimes this happens, a movie sits on my Netflix queue, bumped down again and again by Oscar nominees and feel-good films. I’m glad it finally made its way to my mailbox. In case you haven’t seen it, Changeling is set in Los Angeles, 1928. Angelina Jolie stars as Christine Collins, a single mother whose nine-year-old son goes missing while she is at work. She goes to the LAPD for help and five months later a boy is found in Illinois who fits the description of Collins’ son. After seeing him she insists that he is not her boy but the cops dismiss her. Collins joins Rev. Gustav Briegleb, a local pastor who has been using his radio program to call out the corruption of the LAPD. The police in turn use their power to silence and intimidate her. The story itself is gripping, all of the performances are solid and holding it together are staging, costumes, and music which transport the viewers back to Los Angeles in the late 1920s. After seeing the film I kept thinking about Rev. Brieglaeb, played by John Malkovich. He is so sure of his convictions and completely confident when he speaks and acts. I was reminded of the Public Church course my first year in graduate school in which we read Dorothy Day, Martin Luther King Jr. and Reinhold Niebuhr. I have colleagues like Briegleb around the country, pastors friends of all denominations who don’t flinch when asked to testify in front of state legislature committees or stand on the steps of capital buildings or write letters to the editor or blog posts which are both eloquent and forceful. These colleagues inspire me and I am so thankful that they speak against injustices. Changeling made me ask, why aren’t all of us clergy folks, myself included, like that? As a pastor who works hard to lift up the variety of gifts my parishioners bring to their daily lives and to our congregation’s ministry, I must also believe that pastors have varieties of gifts. Our personalities, past experiences, and training lead pastors to be more or less prophetic in the public sphere. We also become passionate about different issues through the years. During that Public Church class I gladly wrote about Dorothy Day, having just finished a year in Jesuit Volunteer Corps, but when it came to choose a paper topic in Practical Theology I was pulled in a different direction. I wrote about the land, not for the first or last time, and discovered two more great public theologian–Joseph Sittler and Larry Rasmussen. Finally, sometimes pastors, like everyone else, need the right circumstances before they find the words and ability to write or speak or march. As confident as I am that our callings are varied I also believe we all need to be ready for when those moments present themselves. I’d like to think that I’d have raced to board the train or bus so I could join King in Selma, but of course I’ll never know for sure. A few days after I saw Changeling I began thinking about this blog post. Right after my head hit the pillow I remembered that I had not listened to one of my voice mail messages. It was from the secretary of Nampa’s Kiwanis Club asking me if I would pray at the Mayor’s Prayer Breakfast. Clearly this is not my thing (see the rest of this post) but the timing was simply too perfect (see the rest of this post). I was the first one to reply so I had my pick of prayer petitions. I chose stewardship, something not controversial. 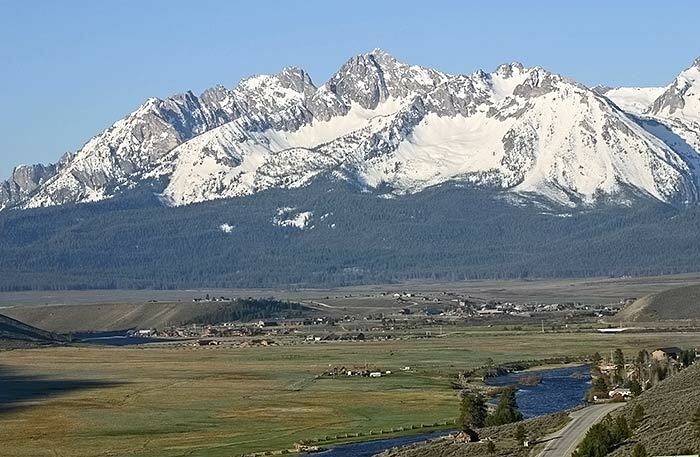 I turned to the Evangelical Lutheran Worship resource’s stewardship prayers and added language from Luther’s Flood Prayer and names of local places we Idahoans hold dear. It all seemed fine until the breakfast began. I looked around the room, gazed up and down the head table and remembered that environmental stewardship and the proper use of wealth can be quite controversial. Too late now. I took a cue from my colleagues who were all introducing their prayers, something I had not planned on doing. I explained that my prayer was shaped by two things: we at Trinity Lutheran Church are so thankful for all of the local businesses that have helped us be good stewards of the New Hope homes we just purchased and spring has come to the Treasure Valley and many of us are preparing for weekends up in the mountains. God of abundance, you have poured out a large measure of earthly blessings: our table is richly furnished, our cup overflows, and we live in safety and security. Teach us to set our hearts on you and not these material blessings. Keep us from becoming captivated by prosperity, and grant us wisdom to use your blessings to your glory and to the service of humankind. Glory to you, O God, for oceans and lakes, for Lake Lowell, Payette, Cascade, and Lucky Peak Reservoir. Praise to you for streams and rivers, for the Snake, the Boise, and little Wilson Creek. Honor to you for meadows, pastures, farm fields and arid plains. Praise to you for forests and mountains, for the Owyhees, Sawtooths, White Clouds and Lost River Range. Almighty God, in giving us dominion over things on the earth, you made us coworkers in your creation. Give us wisdom and reverence to use the resources of nature so that no one may suffer from our abuse of them, and that generations yet to come may continue to praise you for your bounty. Help us always to use Your gifts wisely and teach us to share them generously. May our faithful stewardship bear witness to your love in our lives. We pray with grateful hearts. Amen.